QuickBook front end additional module to Integrated Resources which allows quick input of bookings (perhaps by end users) into the Integrated Resources system. 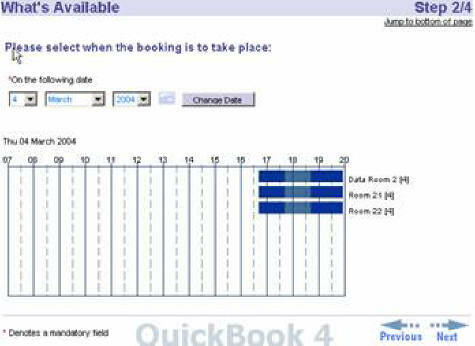 The .HTML page allows users to make provisional/ confirmed bookings quickly and easily into the Booking Schedule. This is the Customizable HTML QuickBook Page. If the anytime button is checked the system allows the schedule to be seen later in the booking process. Now the option appears to introduce attendees, AV and catering to a booking. The system also allows the allocation of a resource type and layout. A listing of Fixed Audio Visual Equipment is available to search on. The system will return the closest match as well as alternatives.